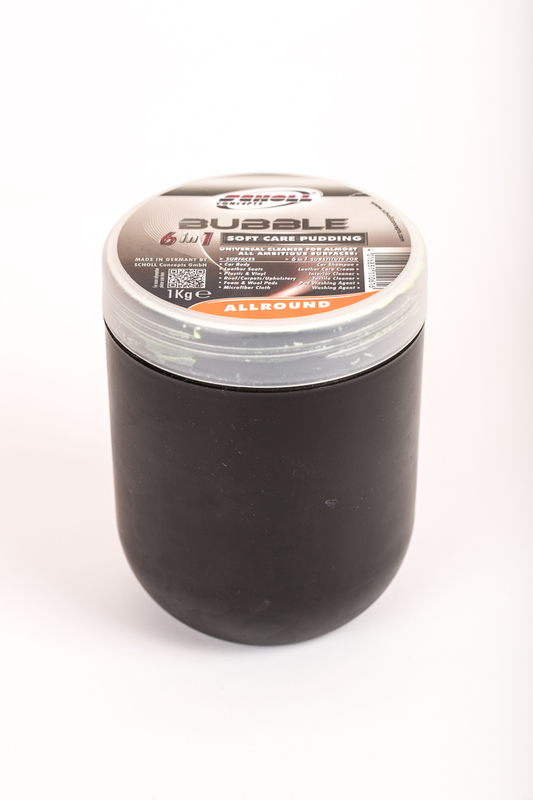 BUBBLE is described as a universal cleaner for almost all sensitive surfaces and ambitious surfaces. It can safely be used to clean vehicle bodywork and paintwork; leather seats; plastic and vinyl; roof, carpets and upholstery and even to wash your foam and wool pads and microfibre cloths. Basically, the Neon-Yellow, citrus-smelling ‘goo’ that is BUBBLE can be used as a substitute for car shampoos, leather care creams, interior and textile cleaners and as a mild detergent and pad washing agent. BUBBLE is environmentally-friendly, phosphate-free and formaldehyde-free. In fact it’s such a ‘nice’ product, you could even use it to wash your dishes or the floor! You don’t need to use much either. For general purpose cleaning just one or two teaspoons in a bucket of water are all that’s needed. Or only three teaspoons in the drum of your washing machine for one load of laundry (at a maximum wash temperature of 60 degrees C). BUBBLE 6-in-1 Soft Care Pudding costs £16.60 (inc vat) for 1kg (SC-11061) and is on sale now.